How Big Was The Iceberg? At 11.40pm on the night of 14 April 1912, on her maiden voyage from Southampton to New York, the RMS Titanic struck the iceberg that would ultimately lead to the sinking of the ship less than 3 hours later. At around 2.20am on the morning of 15 April, the Titanic disappeared beneath the surface of the Atlantic Ocean, a disaster that resulted in the loss of more than 1,500 lives, almost two-thirds of the people on board. Titanic Facts aims to tell the story in a comprehensive and clear way, and to help keep alive the memory of this great and tragic ship, and of her passengers and crew, survivors and victims. There are more than 1,000 fascinating facts and figures to explore within Titanic Facts. Here are a few to get you started, with links straight to the section they are contained in. 269.1 metres – the length of the Titanic (882 feet 9 inches). 825 tons – the amount of coal used per day. 28 – the number of people on board the first lifeboat, which had a capacity of 65 people. -2°C – the temperature of the sea water in the area where Titanic sank. 31.6% – the total percentage of passengers and crew who survived. 53.4% – the percentage who could have survived, given the number of spaces available on the Titanic lifeboats. 12,600 feet – the depth at which the wreck of the Titanic lays. 18 metres – the distance that the bow penetrated into the sea bed. 6,000 – the approximate number of artefacts that have been recovered from the wreck site. There is a great deal of in-depth coverage of the Titanic story on the web, much of it excellent, some of it fanciful. 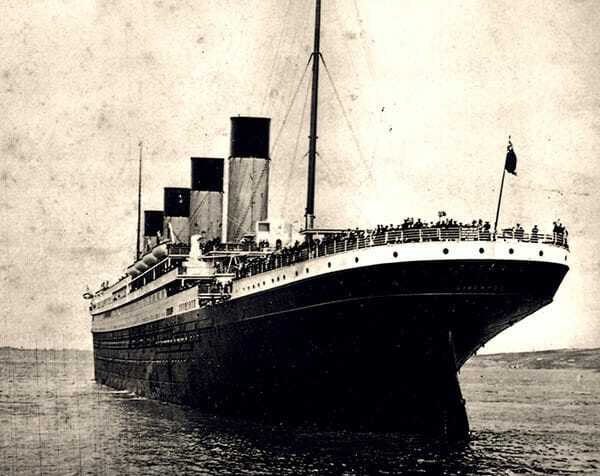 Titanic Facts has been designed to provide a quick and simple snapshot of some of the key facts and figures about the life and loss of this great ship. I hope you find something of value and interest here. All of the facts and figures displayed on Titanic Facts are correct to the best of my knowledge. However myths and misinformation about the Titanic abound, whilst some facts about the disaster are debated to this day. Therefore, do please be aware that the accuracy of the information presented cannot be guaranteed. We recommend that you use this website as a starting point for your research. In using any of the information or images from this website you do so entirely at your discretion. If you use any of the material that I have written for Titanic Facts on another website do please acknowledge this site. Please let me know, too! I’d love to see how you’ve adapted the material. Contact address below. If you spot an entry that you believe requires correction do please let me know; I do not wish to perpetuate inaccuracies. You can contact me at ‘hello [at] history in numbers /dot/ com’.